Saturday night I had the distinct honor of being invited to the Red Sox game with Katie, the delightful writer of Once Upon A Small Boston Kitchen. The SBK, as she is often referred, is charmingly written, and consistently makes me hungry with her recipes and her reviews of Boston eating establishments. Now a Sox game may seem like an odd spot to find to food obsessed bloggers, but really, it couldn't be a better pairing. As I've mentioned before, Fenway is a mecca of interesting food choices, and options that scream Boston from the top of their lungs. Sausage sandwiches with peppers and onions, to the Fenway Frank; cups of Legal Seafood's Clam Chowder to Pizza to the standard Cracker Jacks and Popcorn. 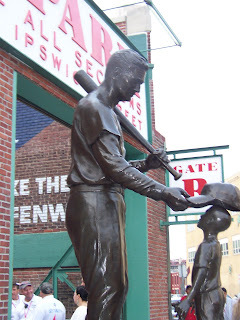 Fenway absolutely encompasses something for every palette. However, Katie and I, always wanting to try something new, decided to eat our dinner at the newest Fenway area restaurant- Jerry Remy's Sports Bar and Grill. For those of you not aware, Jerry Remy is the beloved announcer for our home team the Sox, keeping the fans of Red Sox Nation in tune with every pitch of the game since 1988. Prior to that Remy, or Rem Dog as he is also known, played for the Sox at second base from 1977 to 1985. This spring he opened a brand new sports bar just behind Fenway Park on Boylston Street. Remy's defies the old look and feel of sports bars, instead offering clean crisp lines, light wood paneling, but of course incorporates tons of TVs for optimal viewing from anywhere in the bar. Pre-game time they even tune one of those TVs to their Twitter feed- we had a bit too much fun posting Tweets for the immediate satisfaction vibe as they showed up on the screens for the bar to see. When we finally got down to business (business = food), we found the task of selecting our meal daunting as we wanted to try as much as possible. We settled on ordering a couple appetizers, thinking it to be the best way to get a feel for the space. We decided on their Smoked Chicken Quesadilla's, their Smoked Pork Sliders, and their house-made potato chips. The food was served quickly, but not too quickly, and we got right into eating. I started with one of their Smoked Pork sliders which was served on a buttered roll, with coleslaw and barbecue sauce. I was extremely excited for these as Remy's has it's own smoker- something that is somewhat rare here in Boston. The pork was really nice. Visible smoke ring present, wonderful fresh flavors of smoke and slight sweetness from the rub they used-the meat was delicious. It even had texture variation from the ends to the middle meat. The cole slaw was ok- I always like a bit more acid in my slaw to really keep the crisp flavors present but this was passable. The barbecue sauce also delicious and I found myself dipping the potato chips in it. The rolls however....well I am continuously confused by the need to butter the top of a roll. The inside meat had enough fat to it for flavor, the mayo in the slaw added any creaminess needed...the butter just seemed overkill and made the sandwich very messy to eat. Roll-less though- that's some tasty pork! The chips served were absolutely tasty- when hot. As they cooled they did tend to lose their crisp texture- though their flavor was still on the money for home made chips. I greatly enjoyed dipping them in both the barbecue sauce and that salsa...it was incredible addictive. We had a ball at Jerry Remy's Bar and Grill, and I look forward to returning often. The staff was efficient, helpful and friendly, making it easy to knock back a few pints there and get lost in a game or two. However The Small Boston Kitchen and I had greater plans for the evening- watching the Sox win against Kansas City! I'll be back Remy's....soon. Katie- thank you again for great tickets to a great game! What a super fun night, so glad you were able to make it! And thank you for your kind words, made me blush! 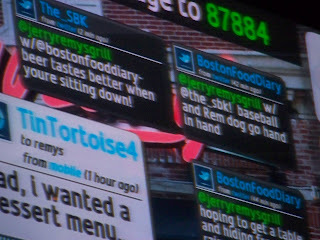 Let me know next time you want to go hang out at Remy's and watch the Twitter board! So much fun!